After the big success of Crash Pulling 1, now the new PART 2 is available. is the most spectacular documentary about Tractor Pulling ever produced. There are more than 450 Crashes shown on this highly actionpacked film. You will see all kind of crazy rides, engine explosions, fires, wheelstands, rollovers and flips, that happened about the last 20 years at the pulling tracks all over the world. All wild rides are new and not seen on the first part "Crash Pulling 1". Almost every wild action pull from the United States and Europe is on Crash Pulling 2. Professionally cutted with original engine sound and some interviews and good music. This is 100 % tractor pulling entertainment, that you have to have in your collection. You will have to watch Crash Pulling 2 over and over again to get all the exciting action on this film. 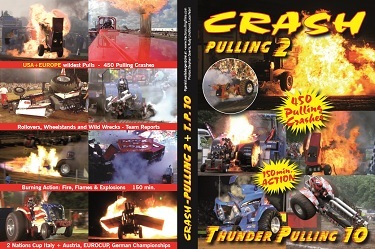 Crash Pulling 2 is explosive, loud, wild, earthshaking and a real "MUST HAVE". Don`t miss it. The "2 Nations Cup" reports about 3 events that Italy and Austria were running together. A lot of new pulling machines are shown at this interesting events. All the stars of the southern european pulling circuit were on the track showing their potential. Like the firespreading Pro Stock "Stars and Stripes" or the modifieds FourNoHemi and Starlight Express Allison power and turbine mini power Hot Iron. Of course we were also on deck at europes biggest event. MADE´S powerweekend in Holland. 3 days of pulling on 3 pullingtracks, offers you one of the best Tractor Pulling happenings. All the NTTO classes and EURO CUP classes compete and fight for the win. There is a lot of action going on, also at night under the lights, with flames and chroom-flashing tractors. Reported with closeup trackside action, onboards, filmed from different camera-positions and full sound. Almost all competitive Pulling Tractors from all over Europe are in MADE and show the high level of european pulling. Team Lambada, Green Monster, LeCoiffeur, Double Screamin, Whispering Giant, Simply Irresistible, Green Spirit, Ivan ....... and hundreds more ........ are "thundering" over Mades PowerTrack with thousands of horsepower. "Wow, what a weekend"
CRASH PULLING 2 and THUNDER PULLING 10 has a playing-time of 2 hours and 30 minutes. You will enjoy europes best pulling competition and the worlds craziest, wildest and most explosive wild rides in Tractor Pulling from all over the world. For only Euro 19,90 plus postage you get this new dvd and tractor pulling entertainment in your livingroom on your widescreen TV. Enjoy it!!!!! 1. Online with PayPal. Price Euro 19,90 (DVD) plus Euro 3,-- postage. Press the button "ADD TO CART".